The Libyan-Tunisian border crossing has seen frequent closures since the Arab Spring Revolutions due to local tensions (Photo: Houda Mzioudet / Libya Herald). 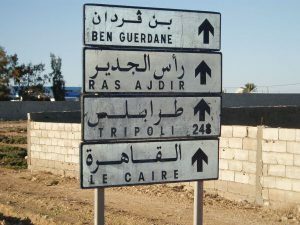 The Information Office of the Ministry of the Interior (MoI) of the Faiez Serraj-led Presidency Council and Government of Accord has announced today that it has decided to continue the closure from the Libyan side of the main Libyan-Tunisian land border crossing at Ras Ajdir. The decision came after a meeting held at Ras Ajdir of Libyan local security, customs and border officials yesterday. The meeting discussed the difficulties and obstacles encountered in the operation of the Ras Ajdir border crossing point and the harassment and attacks on Libyan travellers by protesters on the outskirts of the city of Ben Guerdane. Some Libyan vehicles were subjected to attacks and prevented from returning to Libya over the last two weeks. The agitation by local Tunisians comes in protest at the actions of the security services on the Libyan side implementation of customs laws and regulations, the MoI statement said. Put simply, the local Tunisian border population were objecting on a Libyan clamp down on the smuggling of goods, and with a particular emphasis on subsidised goods. At the conclusion of the meeting, it was agreed that the border crossing would continue to be closed until the Serraj government reached out to the Tunisian government to ensure the safety of Libyan travellers and provide them with the necessary protection.